Georges Barboteu was the leading horn player in France and wrote etudes and other compositions for the horn that are staples of the repertoire and have been used as examination pieces at the Paris Conservatoire. He was "loved and appreciated for his charisma, his steadfast good humor, and his immense cordiality." Barboteu was born in Algiers in 1924. His family was originally from Catalan but had lived in Algeria for generations. His father, Joseph Barboteu, was a professional horn player and professor at the Conservatoire d'Algiers. Georges started horn with his father at age nine and at age twelve was awarded a premier prix at the conservatory. At age 14 he played next to his father at the Grand Casino in Biarritz, France. In 1939, Georges auditioned for the Paris Conservatoire, but World War II broke out and both Barboteus returned to Algeria. Georges played next to his father in the orchestra of Radio Algiers, then after three years his father turned the solo position over to his son. During this time, Georges also studied harmony and counterpoint, learned to play double bass, and wrote his first compositions. After the war, in 1948, Barboteu returned to France and joined the Orchestre National (Radio France) under Charles Munch. In 1950 he was admitted to the Paris Conservatoire, and in 1951 he won the premier prix, soon thereafter winning first prize at the Geneva International Competition. Barboteu played in the Orchestre del Société des Concerts du Conservatoire (the future Orchestre de Paris), solo horn with the Opera Comique, and in 1969 with the Orchestre de Paris. He was horn professor at the Paris Conservatoire from 1969-1989 and founder of the Quintette Ars Nova. Barboteu was a member of the IHS Advisory Council from 1976 to 1979 and appeared as a featured artist at many symposiums. He was elected an Honorary Member in 1998. Barboteu was a consummate musician. He was involved in all styles of music, from baroque to contemporary, including jazz (recording with Duke Ellington). He was a master at inspiring jazz and theatrical arrangers and composers to include horns in their orchestrations, from Franck Pourcel to Claude Bolling. 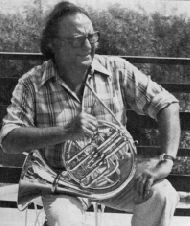 His recordings include an early recording of Schumann's Konzertstück, which was reissued in 1994 with other solo performances on The Magic of the French Horn. A tribute to Barboteu by his friend and colleague Daniel Borgue appears in both French and English in the February 2007 issue of The Horn Call.